New data released by the Census Bureau on Tuesday suggests that the demand for housing – particularly among young adults – may be growing. As many news outlets have reported, the CPS 2016 Annual Social and Economic Supplement with household income data for 2015 showed that real median household income rose 5.2 percent from 2014 to 2015, to $56,516. It was the first annual increase in median household income since 2007. Median household incomes were up for each region of the country, and for non-Hispanic white, black, and Hispanic households, and across all age groups (Figure 1). 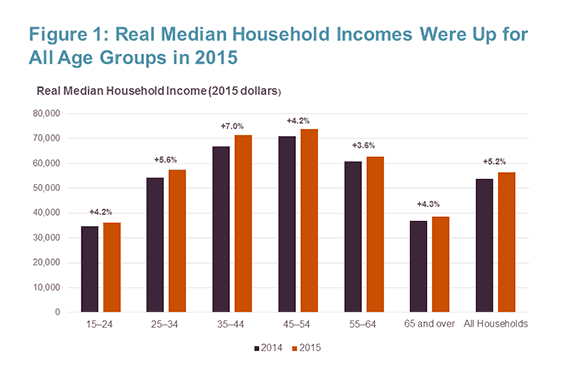 The data release also showed significant increase in real median earnings at the person level in 2015, which grew 5.0 percent for all adults over age 15. 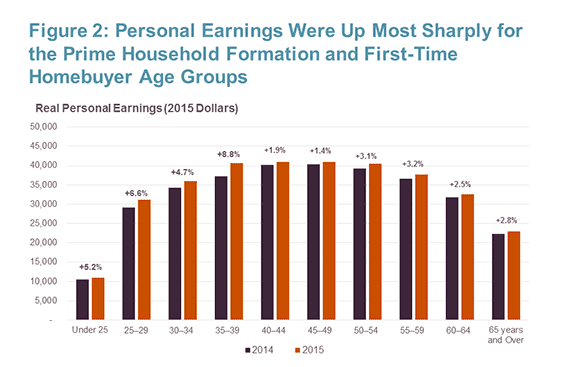 Incomes were up most sharply among younger adult age groups under the age of 40 (Figure 2). For several reasons, this growth is likely to have significant implications for housing markets. First, at the individual level, higher incomes increase demand for housing. For young adults, housing independence is closely linked to income. Those with higher incomes are more likely to be able to rent their own apartment. Analyses in the Joint Center’s 2016 State of the Nation’s Housing report describe this, adding that nearly half of the decline in household formation among young adults aged 25-34 across the Great Recession was due to declines in income suffered by people in this age group. Income growth can therefore work in the reverse, helping enable young adults to move out of their parents’ basement and into their own home. At the household level, income growth also increases housing demand, particularly for homeownership. As higher income households are more likely to own homes, increases in incomes among households will work against the continued decline in the US homeownership rate. In terms of affordability, the strong association between household income and housing cost burdens also means income growth may help alleviate some people who are stressed with housing costs, but on the affordability front there is still a long way to go. Finally, it is worth noting that the Current Population Survey Annual Supplement is a relatively small survey with a high degree of annual volatility year to year, so the exact movements of household income and personal earnings measured year to year should be viewed with the wide margin of error they require. That said, the income growth reported in the latest survey is still a good sign that improvement in jobs and the economy is now translating into increased earnings that is likely to lead to growth in households and greater demand for housing.